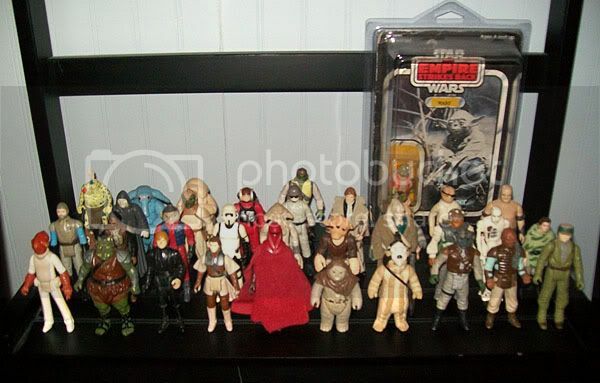 I'm not sure if this should go on General Star Wars Discussion or Memorabilia Discussion, but this is a thread to share pictures of your Star Wars collection. I'll start it off in the next post. My wife finally let me put up some of my Star Wars collection, in a corner, in the second bedroom. Hey, it's better than nothing! I have about 20 duplicates and only a handful of my figures have all of the accessories. I also have most of the vehicles and creatures that I played with my whole childhood. It doesn't look like much, but I'm proud of it. Nice dude, nothing brings back the nostalgia for me like those action figures...check out my website under star wars/custom cards and you'll see what I mean. "Whenever you find yourself on the side of the majority, it is time to pause and reflect." - Mark Twain. Amanaman and EVE-9D9 are quite rare. They are not from the Return of the Jedi collection, but from the original Power of the Force collection. Nice collection doubleofive! They all look like they are in very decent condition. I have the full Star Wars collection, and all of the Empire Strikes Back collection minus the black Cloud City security guy. You have several Return of the Jedi figures I don't have, and I also only have a small handful of Power of the Force figures. I must say though, you figures look fantastic, best I can tell from the pictures. Many of my are loose and missing most of their accessories. My mom was one of the garage sale moms, she didn't like to spend the money on new stuff, so many, but not all, of my figures were second hand by the time I got them. I didn't mind, because unlike my friends who got one or two carded figures for their birthdays, I'd get a shoe box with five or six used figures in it! All my ships, with the lone exception of my beautiful Snowspeeder, are beat to pieces and missing almost everything they could possibly be missing. My Ewok village is in pretty good shape, but my Death Star, which I got brand new, has been played with, put together and taken apart, and knocked over to simulate being blow up so many times, that it is pretty useless these days. Honestly, that was my favorite toy ever. I don't think there was a single toy I ever played with as much as that Death Star. Oh boy a star wars toys thread! Yeah I have all those figures up there, missing r5-d4, and I have Amanaman and Eve-9d9, I even have the ewoks you are missing. Much more at my site in my signature link. Well oddly enough it is possible to see examples of this type of tile very clearly on screen during the death star assault in ANH however it is impossible to screen match needless to say,lol! Mine is a very small collection but here in the Czech Republic it is virtually impossible to come across an OT toy or basically anything so I'm still very proud of it, especially of the various editions on VHS and DVD. Good gravy, what a bump! I would also very much like to add some STAR WARS laserdiscs to my collection, in fact I tried but didn't win the auction. As far as I know, these UK releases were never part of a trilogy set. Certainly, the copies I own were bought separately. I like the look of those covers (my LD to DVD used a very similar style). Did you make them yourself? Yeah, I did, they're basically just scans of the original VHS covers adjusted to a DVD size, I don't think I have the files anymore. And that's interesting information about the boxed set, because I'm 100% sure that the German fullscreen versions of this release were in a beutiful box which included the Classic Creatures: Return of the Jedi documentary. So maybe it was just the widescreen versions that came out separately. The only things I have that the average collector might not are some display thingies from 1997. My only vintage figure. I haven't been able to find any and have been too lazy to look online but I've found a local place that has quite a few. I'll go back soon. (well, teenaged) brothers could look at the Star Wars stuff I still have at get house. I said they could, as long as they sent me a spreadsheet of what all I have there. So I finally have a listing of all of my vintage stuff, which got me excited about my collection again. Glad others got excited at the same time!